Six-Points-to-Four-Quads speeds up the "patch end caps"-process of William Vaughan’s workflow “Modelling text with SubD’s”. 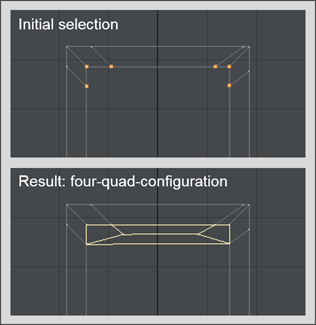 In order to avoid the creation of tiny quads and to create a cleaner polygon flow, William Vaughan suggested a four poly configuration to patch end caps. Instead of creating this configuration for almost each letter of your text by hand, you can speed up this task by utilizing Six-Points-to-Four-Quads. Simply select (a multiple of) six points and run the plugin to achieve a four quad configuration for each set of six points. Create multiple four-quad-configurations at once by selecting a multiple of six points. Ignore the typical selection order by choosing the plugin's Smart algorithm. A usage dialog is shown when you run the plugin without meeting the required "multiple of six points" selection criteria. It features a comprehensive logger to help you find errors that occurred during the modeling process. a compiled LScript only available for registered versions (Win & Mac) of NewTek's LightWave Modeler. A 6 minute video showing the Six-Points-to-Four-Quads plugin in action is now online.